“Show me your relationship to Muhammad, and I will show you what kind of Muslim you are,” says Omid Safi in his work, Memories of Muhammad: Why the Prophet Matters. I read Safi’s Memories of Muhammad a couple of years ago as a required text for a graduate course and since have found myself frequently referring to it either as a casual read or to cite within other essays. While a lot of my colleagues concluded the text too simplistic and disengaging, I thought that while maybe not intended for those thick in the weeds of Islamic Studies, Safi’s book contributes to both an alternative discourse on the Prophet among a public audience–introducing why the Prophet (saws) matters in the lives of Muslims–and also redirecting us to an intra-Muslim dialogue on the role of the Prophet, as cosmic and social engineer, in shaping Muslim communities. There are, of course, many publications on the life of the Prophet generated for a general audience, but most fail to document the community of Muhammad’s memories and spiritual aspirations to embody the character of the Prophet. This is an essential lens when reflecting on the theological pinnings and social undertakings of Muslim communities. If, as Safi puts it, “the goal of the community of Muhammad is to be led by Muhammad, and from Muhammad to God,” then certainly we must have an understanding of how Muslims interpret the Prophet’s life and how his sayings and actions are implemented within communities today. Safi’s intention with the text is to “engage the memory of Muhammad and to explore how he has been remembered, commemorated, and, contested by his followers throughout the centuries.” Additionally, he “provides an account of how Muhammad has been received in the hearts of his community and how he should be received today and tomorrow.” Safi successfully introduces the Prophet to those unfamiliar, while simultaneously reintroducing Muhammad to his community of followers. He does this through “stepping in and out of his life narratives and looks at how Muslims have remembered and interpreted these significant episodes.” He focuses on the mi’raj, the ascension of the Prophet, as a defining moment in Muslims’ emulation of the Prophet and consequently their differentiation. Muhammad alone disembarks and enters into the divine presence. Here is the full promise of what it means to be human: we can ascend to a height and a level of intimacy with God that angels dare not attempt. This is the return to one’s Origin–to be transformed into the very light of God at the core of our fitra. Only light can enter into light–only that which comes from God can enter into divine presence. The Mi’raj exemplifies the astonishing capability of humanity to enter into this communion, this mystical experience with God. As Muhammad ascends, so too does the community of Muhammad aspire to ascend. As Muhammad goes, so goes the Muhammadi community. 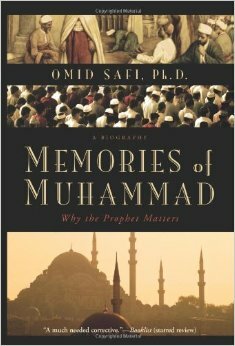 I suggest reading Safi’s Memories of Muhammad as a quick casual read while gathering some interesting source points and questions for thought. If you’re looking for a more comprehensive biographical text of the life of the Prophet, this is not going to be your book. If you’ve already read or after you’ve finished, I invite you, as always, to share your thoughts.